Reports & Analytics- Not just good looks. 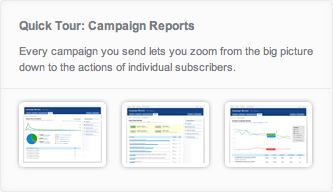 Promothon provides a comprehensive set of real-time reports allowing you to accurately measure the effectiveness of every campaign you send. 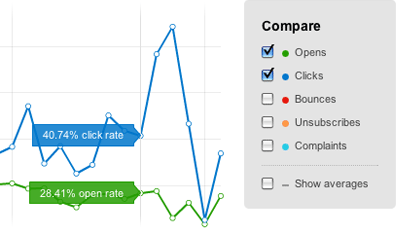 Go beyond opens and link clicks and measure your campaign related sales, conversions and ROI. See who is opening it, what parts of the campaign they are interested in, who forwarded it on to a friend, unsubscribed, bounced out or even marked it as spam. Take this a step further and see your lifetime history with that person. Which campaigns they opened, what links were they interested in, how many times have they forwarded my emails? 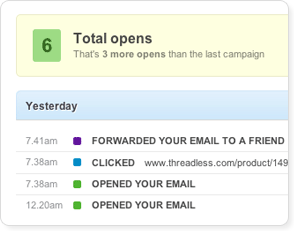 The hardest part about designing emails is making them look great in the dozens of email clients out there. Our email client report makes that a thing of the past by showing exactly which email clients your subscribers are using. When you combine this report with our design and spam testing service, you can generate screenshots of exactly how your design looks in all these email key clients with a single click. Save yourself time and frustration by only focusing on the email clients that matter. In a single new report, email has just caught up with the web. It's easy to look at your web analytics and decide it's not worth testing in IE6 any more. Now you can be just as informed about which email clients to worry about. 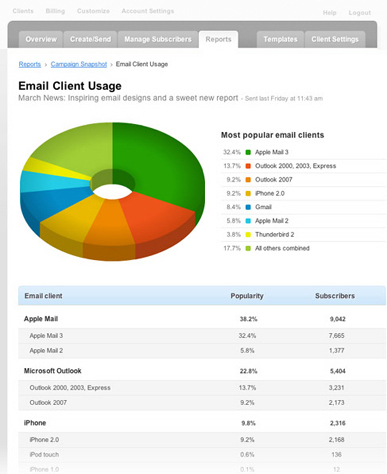 As well as showing which email clients are being used, the report also splits them up by version. This is crucial for email clients like Outlook, where your real concern is Outlook 2007 users (which has poor standards support) as opposed to those using previous versions (which have great standards support). We also list the 8 most popular clients at the top of the report so you can quickly see the versions that need your attention.